About a year ago I tried my hand at cellaring beer. Which was pretty stupid of me. Why? Well, because I made some really dumb selections. Take the 2013 Coopers Extra Vintage – one beer they always talk about putting down for a year and it’s supposed to get better. I loved that beer’s fresh hoppy, fruity flavours, absolutely loved it. So I bought half a case of it – not to drink but to put aside. Yep, I loved the hoppy characters and yet I cellared it, a process known not to be too kind to hops. Other times, I cellar something because it’s way more alcoholic that I realised and it scares me a bit. So I put it away under the stairs and try to forget it’s there. Other times I cellar a beer I’ve never had, which has to be really stupid. It means, when I do eventually try it I have no idea if the ageing made it better or worse, because I have nothing to compare it to. If I’m only going to buy one bottle it makes as much sense to drink it now rather than wait a year. Sometimes I cellar by accident, where I buy a beer and actually forget I have it until, months later when I uncover it hiding in a nook at the back of the cellar. Finally, there are the beers I deliberately avoid drinking because they’re beers I know I will never, ever find again. So if I drink it, then it’s gone forever for me. All of which, I’ve decided are stupid reasons not to drink a beer. Beer is to be enjoyed not to be hidden away, aged or whatever else we do with it. Which brings to declare the Drink It You Idiot week here at Beer Is Your Friend. A week where I’m going to drink some of these damned beers – and hopefully enjoy them. First cab off the rank is the 2012 Stone Beer from Stone and Wood. 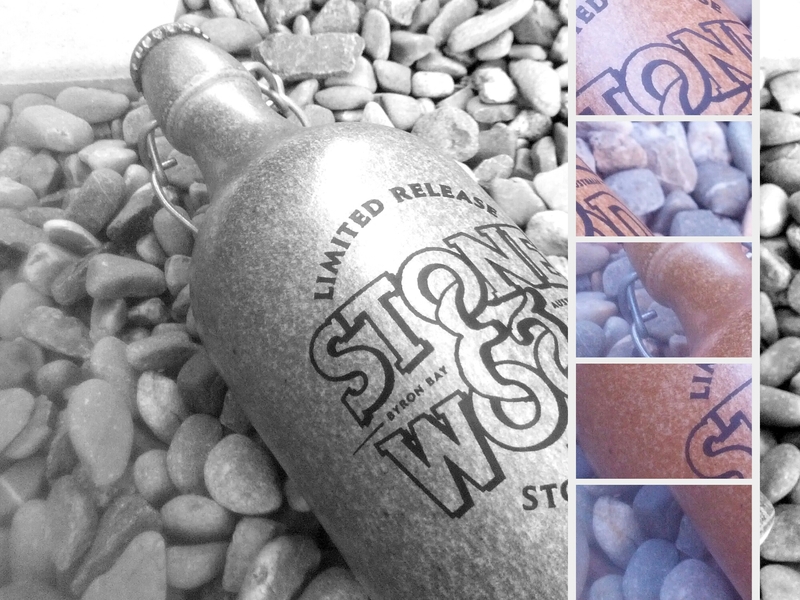 This one’s doubly rare as it comes in a ceramic bottle – so it’s extra fancy. They send it to me as a promo sample and I thought, ‘‘wow, I can’t actually drink this. I should hang onto it instead. Until when? Jeez, I don’t know’’. Until now. I cracked the swingtop on that ceramic sucker and utterly enjoyed a sublime beer. If you’ve got a bottle of this at home, open it and drink the thing now. Probably with dessert, because it throws off loads and loads of sweet delicious chocolate flavours. It’s mainly dark chocolate with a lick of sweetness and just a hint of coffee at the back end. Man, if the rest of the week goes as well as Day One, this is going to be a frigging awesome week.